A thousand apologies....After thesis we thought we were going to be living large, and we were, for a couple days. But this week threw 3 finals, a group project, and a Spanish essay at me, while Moose has had the Ralph Ellison syndrome. I might have to call Prof Bradley up to finish Moose's post on Guru, but in the mean time, here's a little more Outkast loving for yall. Storytelling. Putting together words to tell about an experience, to educate, to pass on knowledge. Stories can be used to tell tales of past glory, to let the world know how big you're going to make it, to tell the younger cats how to live. Rap is nothing if not storytelling on a beat. And Outkast is nothing if not the best storytellers on the planet. Following the Art(s) of Storytellin' Part I and II on their classic album Aquemini, (anyone know what happened to Part III?) 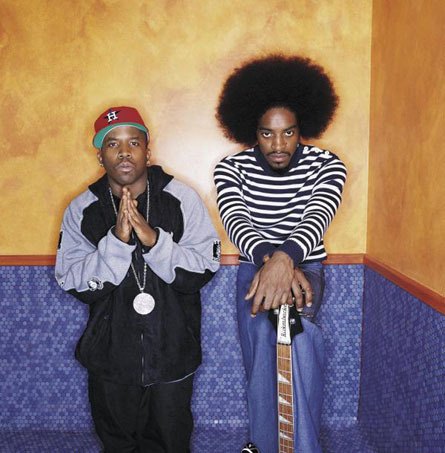 Outkast dropped part IV in November 2007. It had been a year since their Idlewild soundtrack and four years after their last double album, Speakerboxxx/The Love Below, and the masses were hungry. They needed their fill of real Outkast, something harder than their period piece soundtrack and disjointed double album. Strangely, Outkast dropped this absolute jewel on DJ Drama's Gangster Grillz album. How Drama got two of the greatest ever to come together and make this none of us will never know. But that studio must have been straight lava hot when the two dropped Part IV, Eyjafjallajökull like, if you may. Andre comes out swinging. Mayweather. In a minute and 26 seconds, Dre drops knowledge like only he can, kills "making it rain," and gives his take on the rap game. Dre's flow is effortless but urgent, and with enough in-rhyme and wordplay to fill a poetry book, Dre right away proves that even without a true Outkast album in the last seven years, he's still top 5 D.O.A. Following up Dre is Big Boi, attacking the beat with a different flow than Dre, but with the same urgency. While Big Boi's been more prolific lately than Andre, he's always been the less regarded of the two. And while his verse can't compare to 3000's his storytelling shines. And that's what it’s all about, that's what rap is about, and that's what Outkast is all about.